Landowners in the Upper Bad River Watershed are taking advantage of cost share dollars by implementing conservation practices designed to hold soil in place and prevent soil erosion and sedimentation in high risk areas. The Conservation District is "Paying for Performance" to find the best soil saving practices in the area. Instead of paying per acre, GCD will pay per ton of sediment you save. Check out the updates below or browse through all blog posts about the Bad River Watershed! Field practicing no-till with a cover crop in Gratiot County gets an annual payment from the Conservation District. Viewing a field from an aerial view can illustrate where conservation efforts are most needed. Keeping permanent vegetation between a field and a stream goes a long way towards keeping the stream free of sediment buildup. 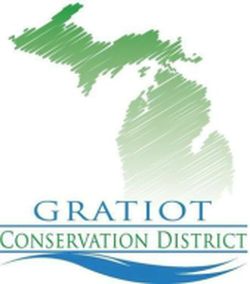 Gratiot Conservation District is working with an online tool developed by MSU-Institute for Water Research called the Great Lakes Watershed Management System (nicknamed the Sediment Calculator). It is available for any property within the Saginaw Bay Watershed. But, how does it work? The Gratiot Conservation District welcomed US Congressman John Moolenaar (R – Michigan) to Kyle Bolt’s farm in rural Gratiot County in November for a field day showcasing the results of the Upper Bad River Watershed (BRW) Sedimentation Reduction Program.